With the release of his tenth film earlier this year (Romantic Heaven, 2011), it is a good time to look back over Jang Jin’s impressive output and immense contribution to Korean cinema. Formerly a playwright, Jang has regaled audiences over the last decade with his clever, genre-bending, and socially relevant films. Aside from the ten films he has directed, which include Guns & Talk (2001), Someone Special (2004), and Good Morning President (2009), he has also found great success in the films he has written (some based on his plays) and produced. These include the enormously successful Welcome to Dongmakgol (2005) and the brilliant Going By the Book (2007). What his evident throughout his oeuvre is foremost his sparkling dialogue and his astute bending of generic conventions. His films can all be labeled as comedies but to leave it at that would do him a great injustice. His mordant wit cuts through a society that is still reeling from a past fraught with violence and encumbered by authoritarian governments and an incompetent civil service. His films have taken aim at the police (Going By the Book), politics (Good Morning President), and the media, among other things. Murder, Take One uses a clever concept which explores in equal measure the preying eye of the media and the oppressive authority exercised by local law enforcement. The film opens with a fresh murder in a hotel and then showcases its investigation by the police which is, and here’s the hook, being televised nationally. The police exhibit violence, incompetence, and in-fighting, which is typical of Jang’s films and of Korean cinema in general; the media is intrusive, sensationalist, and exploitative; and the suspects all have their motives which fit into one melodramatic trope or another. 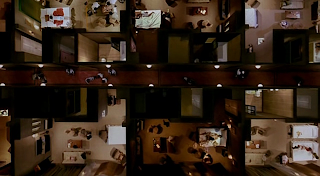 Jang bombards us with a vast amount of themes, ideas, styles, motifs, and genres all throughout the film’s opening salvo which is a virtuoso display of technique and craft as we are brought up to speed on the crime scene and all the characters that populate and surround it. As impressive as the visuals are, what most struck me in this scene was the sound: first of all the great music, but then the build up of voices and sounds blending into eachother. 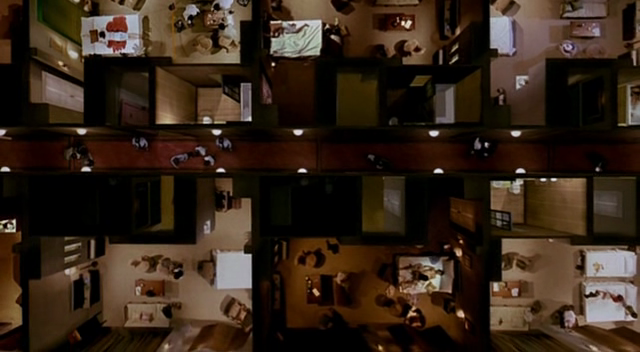 Couple this with the shot which begins by swirling above the victim’s body but then pulling out to reveal the contents of all the adjoining hotel rooms and what you have is a mosaic of intersecting lives. The body and thus the murder are only a small part of the tableau, Jang demonstrates early on that while ostensibly a procedural, Murder, Take One will not limit itself to the search for the answer to one question, who killed the girl? Instead, as it lumbers more or less along that trajectory, it will invite us to learn about peripheral characters and witness a veritable range of interactions. Characters frequently veer into pedantic, irrelevant, and hilarious details. The early interrogation scene is a brilliant display of acting and poor communication which, despite being watched by millions on TV, devolves into a silly argument over linguistics, the irony is sublime. Without accepting this intention, it will be difficult to appreciate the film. As a procedural it is certainly interesting but it does not follow a satisfying trajectory, as a comedy it often seems to be stop-start and sadly without a firm grasp of Korean (which I do not possess) it appears that much is lost in translation. As other reviewers have noted, the joy of watching this film will come from your appreciation of the bit roles and supporting characters. 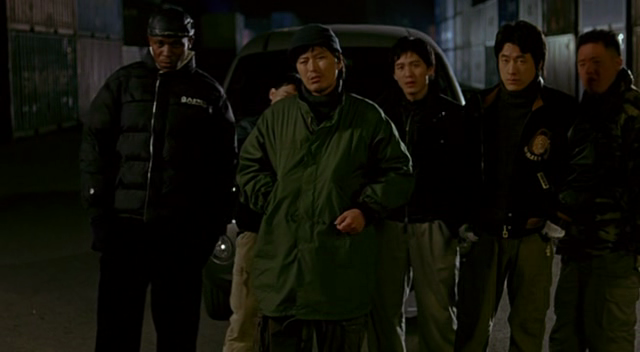 Jung Jae-yeong, one of my favorite Korean actors, appears briefly as an odd gangster and is hilarious as always. From a technical standpoint the film looks and sounds great, although I wonder if aside from a few key scenes Jang just went through the motions. A lot of the proceedings feel like a 1980s Hong Kong action flick, perhaps it was easier to follow that blueprint for the obligatory procedural scenes which seem to detract from the real focus of the film: the characters and their interactions. The final section of the film, which focuses firmly on the case, underwhelms yet still achieves its likely intention of subverting audience expectations. Throughout the film the dialogue is amazing and those who speak it, do so well and with gusto. Shin Ha-kyun, who starts out as a primary character but gently fades away (sadly), is a standout. While not one of Jang’s best it is still a thoughtful and clever addition to his filmography and a valuable and worthwhile entry for Korean film fans.